Happy Thanksgiving. 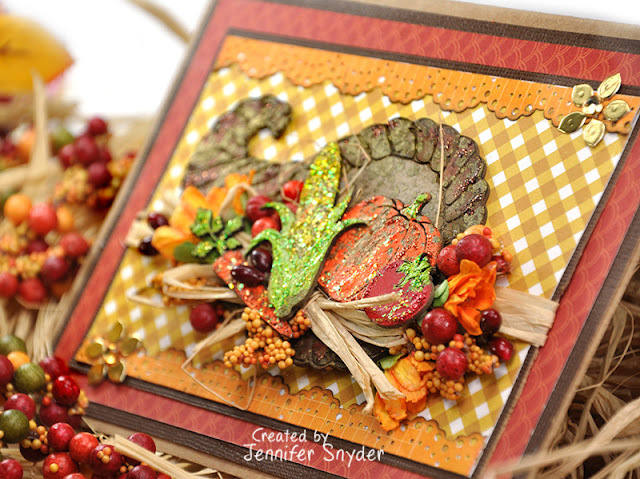 I'm here to share some Thanksgiving wishes. My cards are adorned with fabulous chipboard designs from Creative Embellishments. I treated the chipboard Acorn Clusters quite simply. 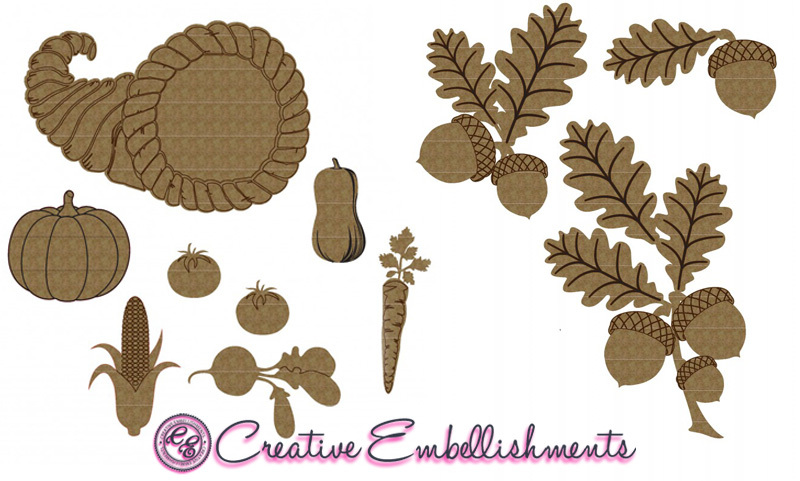 The Acorn Clusters have been heat embossed by dabbing Clear Embossing Ink onto the chipboard and then coating with Stampendous - Frantage Aged Gold Embossing Enamel or Fine Antique Gold Embossing Powder . A quick blast with a heat gun to heat set and you have gorgeous aged acorns and leaves. 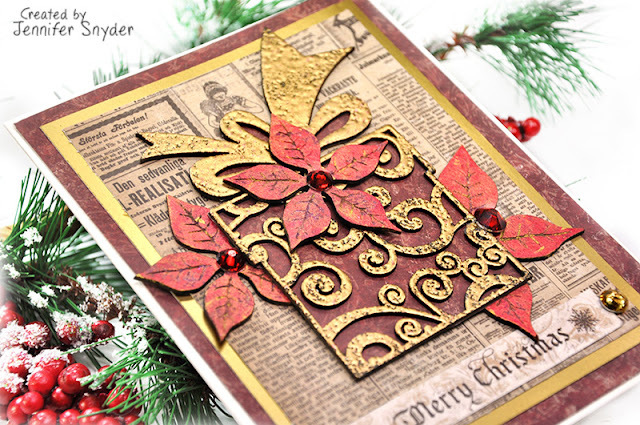 The aged gold also looks great with my paper choice, The Story of Fall from Echo Park. Top the card with some robust flowers and raffia, and it's all wrapped up. I love raffia for fall/Autumn pieces. It feels so earthy and warm to me. 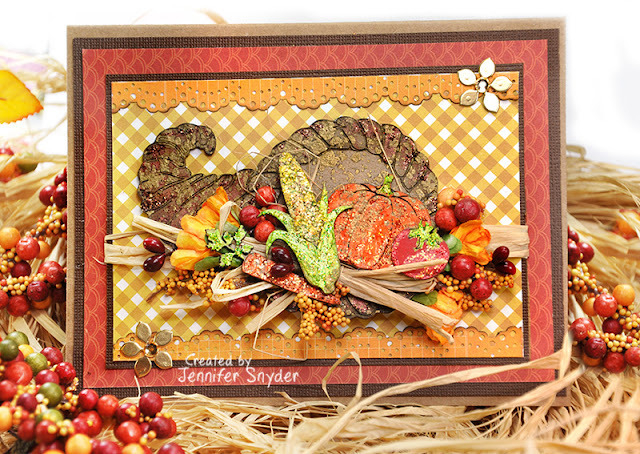 My second card showcases one of Creative Embellishments coolest Thanksgiving designs - Cornucopia Set 2. 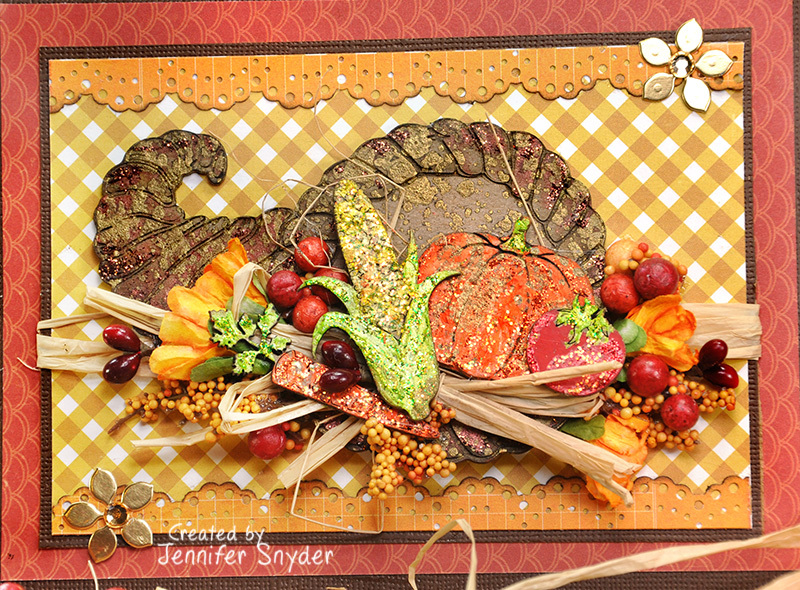 And the little veggies/fruits....well they are so darling. The cornucopia is a strong symbol of abundance - and at Thanksgiving time, it symbolizes the abundance of goodness, thankfulness and blessings. 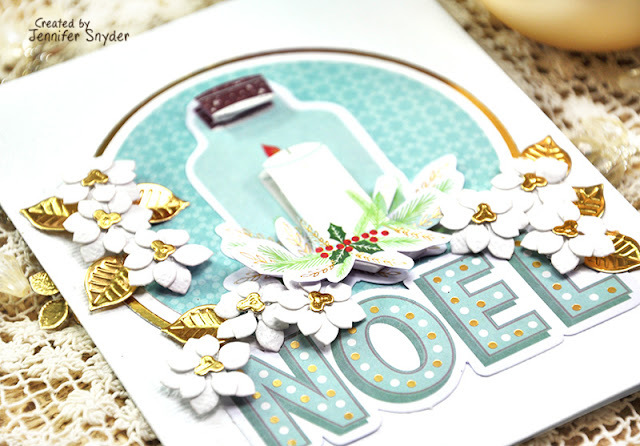 My chipboard has been painted with acrylics and then enhanced with dabbs of Stickles Glitter Glue - Sprinkled Sugar. 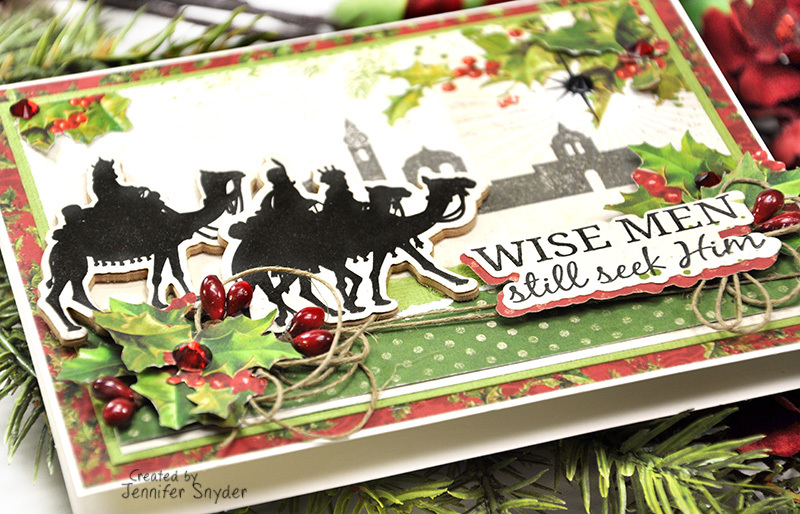 I'm here today to share my card for the holiday season featuring an older collection from Maja Design while I wait to receive the new Christmas collection "Christmas Season ". 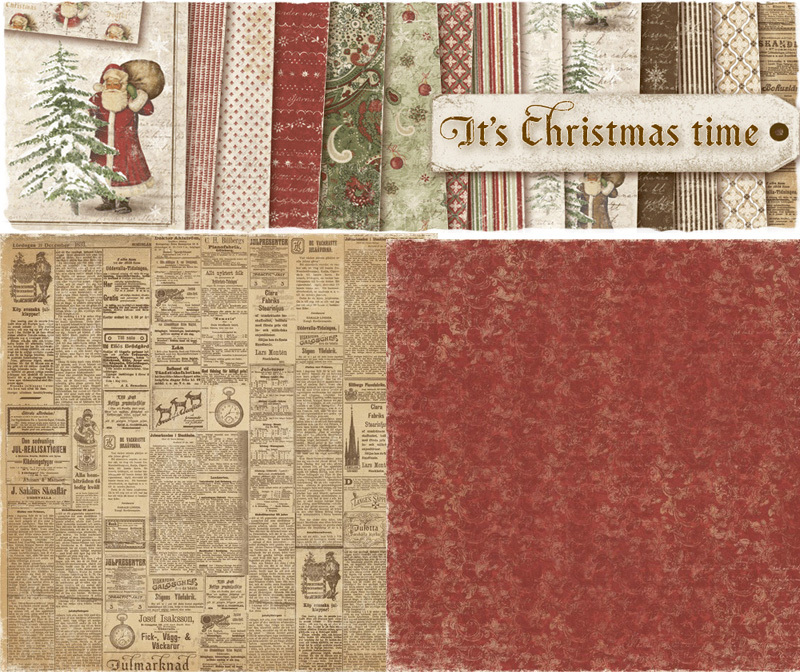 Below is a preview of the gorgeous new collection, "Christmas Season"
You can shop for the newest "Christmas Season" here. 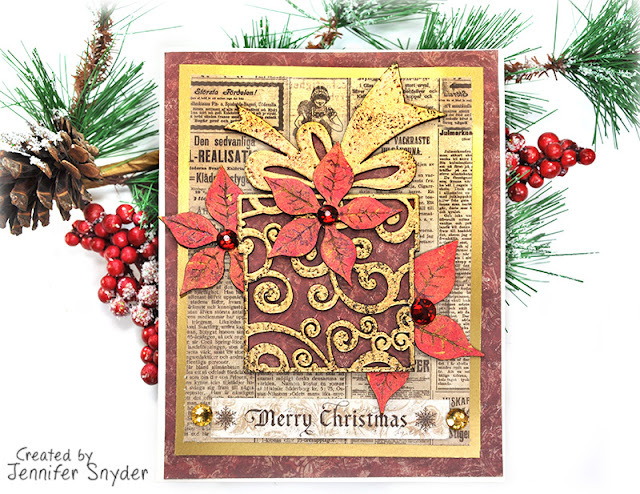 I love the rich warm colors of this vintage collection. 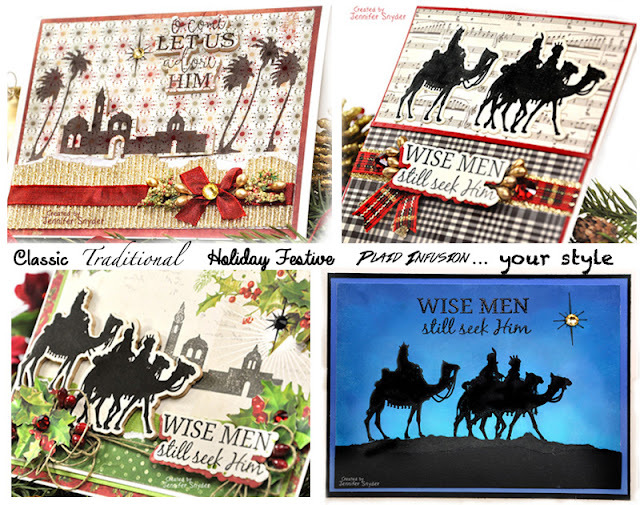 It's truly looks like pages from Christmas past. I used some chipboard embellishments from Creative Embellishments. I treated the chipboard quite simply. 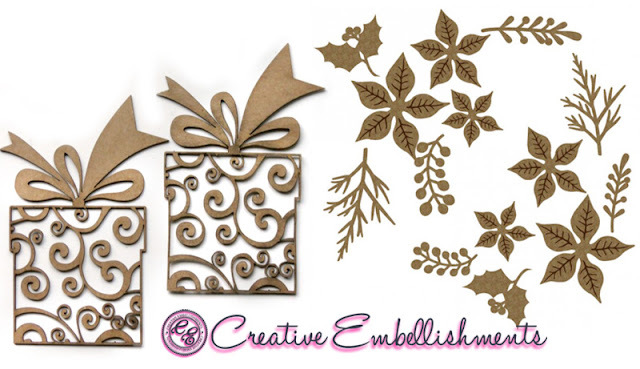 The Flourish Presents have been heat embossed by dabbing Clear Embossing Ink onto the chipboard and then coating with Stampendous - Frantage Aged Gold Embossing Enamel or Fine Antique Gold Embossing Powder . A quick blast with a heat gun to heat set and you have gorgeous aged filigree gifts. 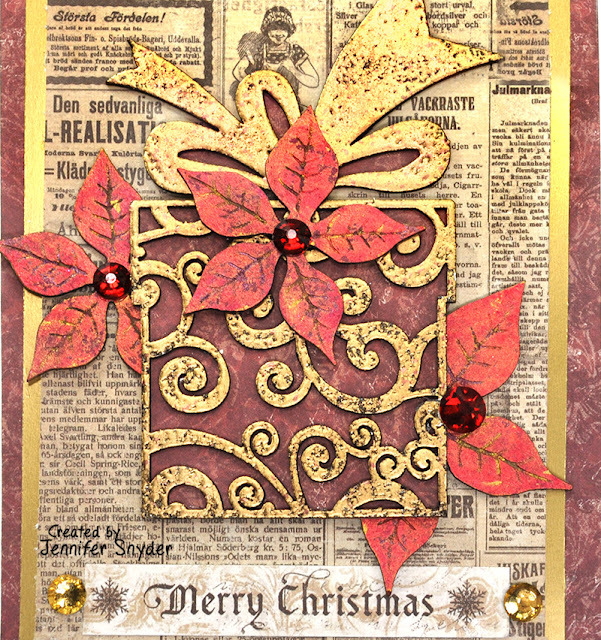 The Poinsettia Set flowers have been painted gold first, ( I used Prima Finnabair Art Alchemy - Acrylic Paint - Metallique Ancient Coin ). 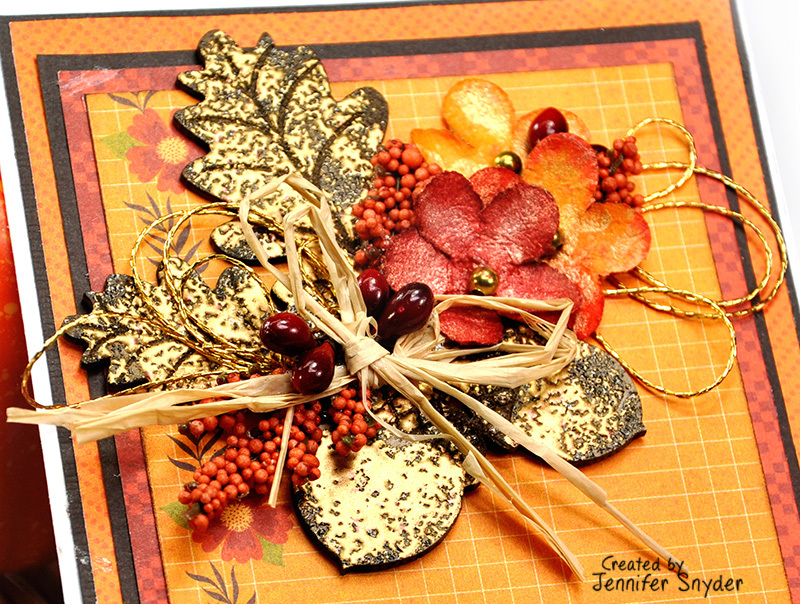 Then I painted a coating of Prima Color Bloom Spray Mist - Boysenberry over the gold. 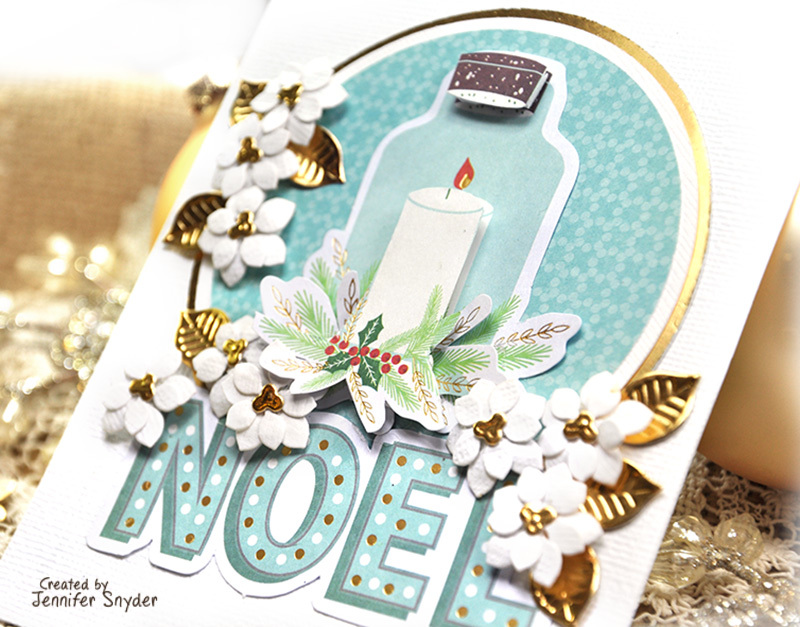 Finish the card with some holiday gems and it's starting to look like Christmas. 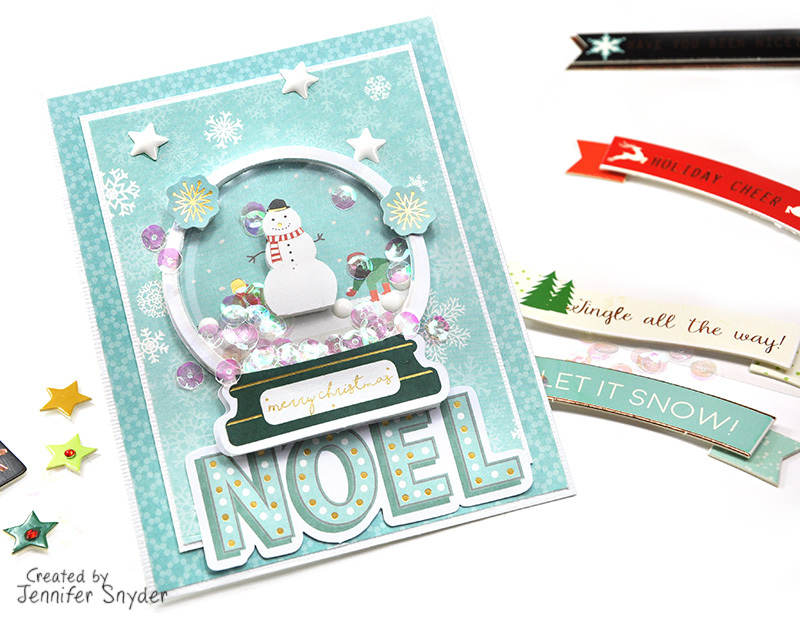 May your Christmas Season be joyful and filled with wonderful crafty love. 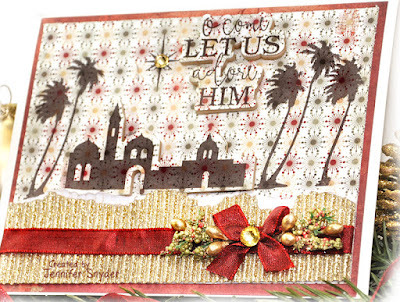 Shop for the collection - It's Christmas Time" here. 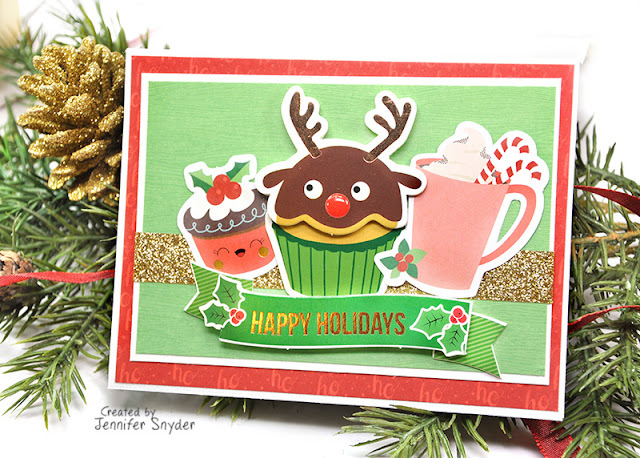 Today I am featuring the Deer Santa extras from Spellbinders Card Club for November18 . My cards today showcase the papers, stickers and diecut shapes that are sold individually as "Extras" and are spectacular and peaceful for the season. The Deer Santa Nov. Club kit sold out is record time this month. 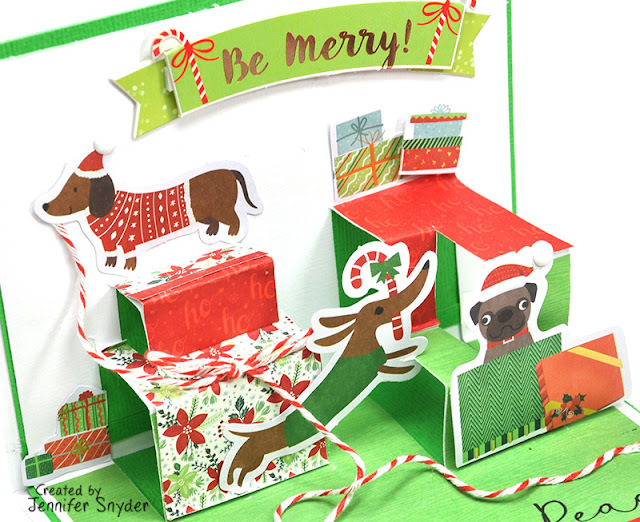 BUT you can still grab the amazing Deer Santa Extras. 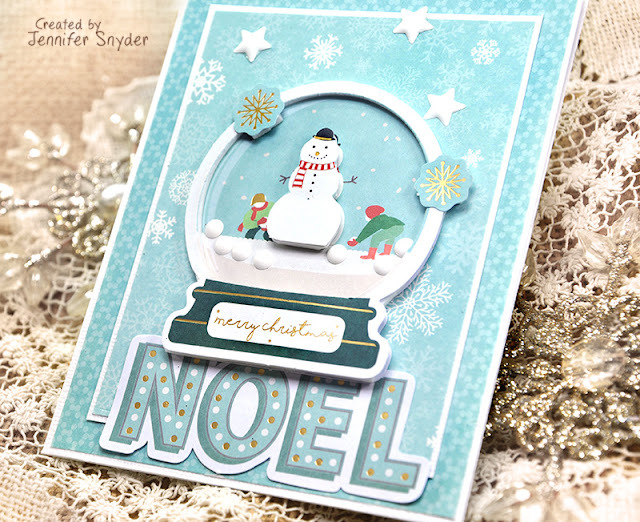 Snow globes are so popular, so I thought I'd use the beautiful globe design that comes in the Deer Santa die cut shapes ( card kit of the month extras) and make a dimensional card. I decided to take the card design a little further and make a shaker card using the packaging from the stickers as the acrylic cover on the card. 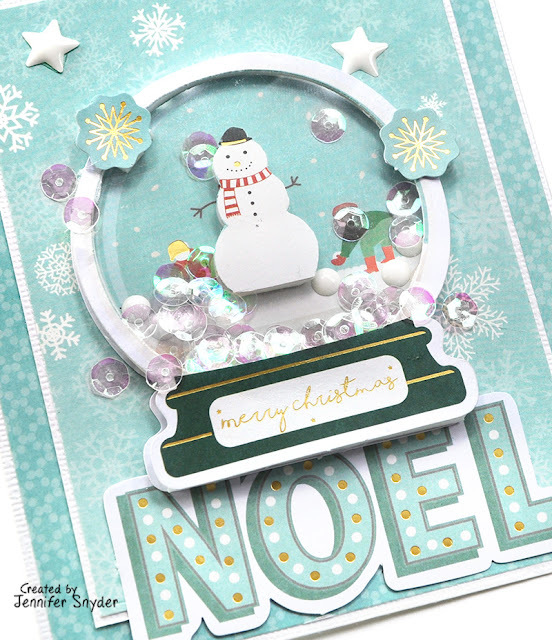 I adore shaker cards and this little snow globe diecut shape is just begging to be turned into a winter shaken blizzard. Here is another dimensional card I created using some of the Deer Santa die cut shapes ( card kit of the month extras) . Club cuteness. 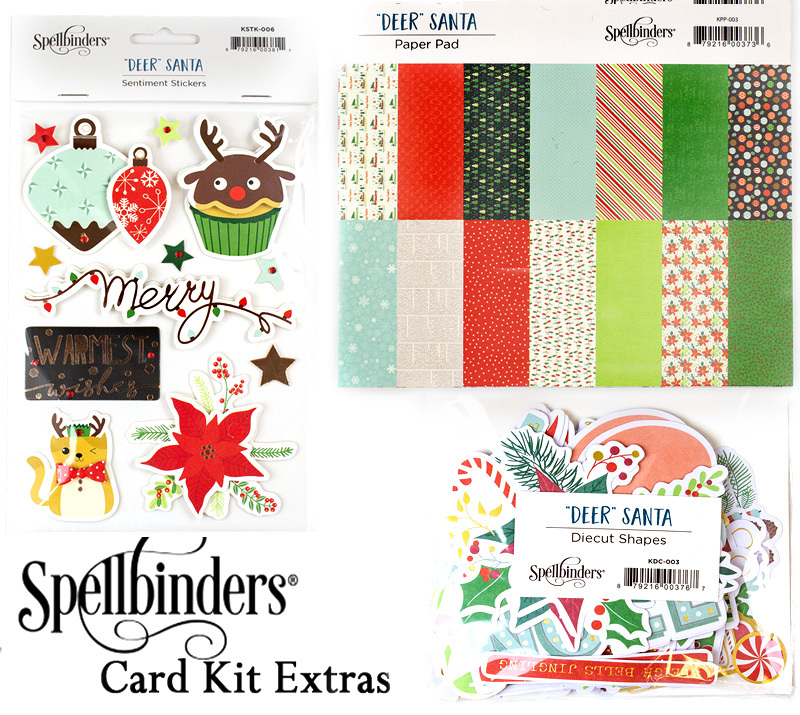 If you missed out on the Card kit for November, then hurry and grab the darling whimsical Extras. Fun Stampers Journey and Spellbinders have joined together and are bringing you the Magi of the season - I mean the the magic of the season. It's true. 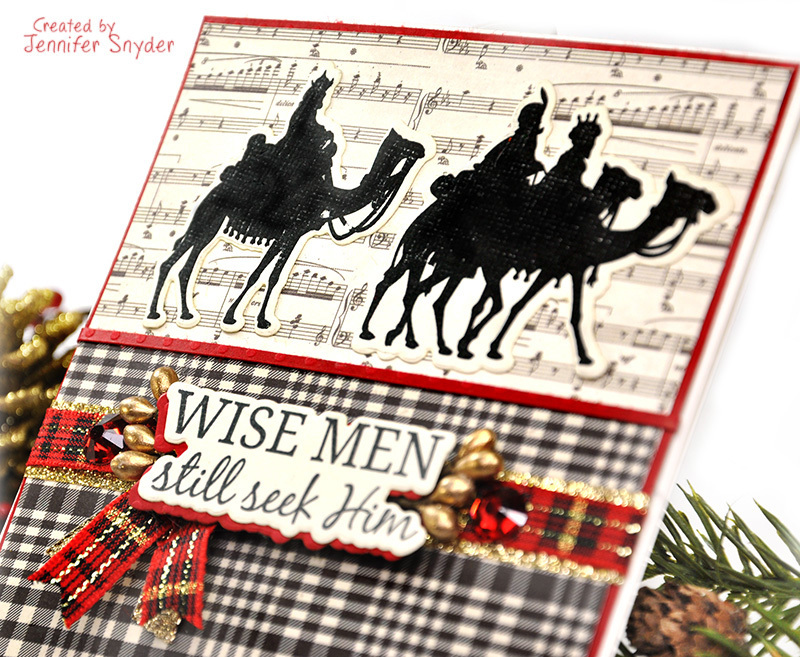 You can now find FSJ products available at Spellbinders. 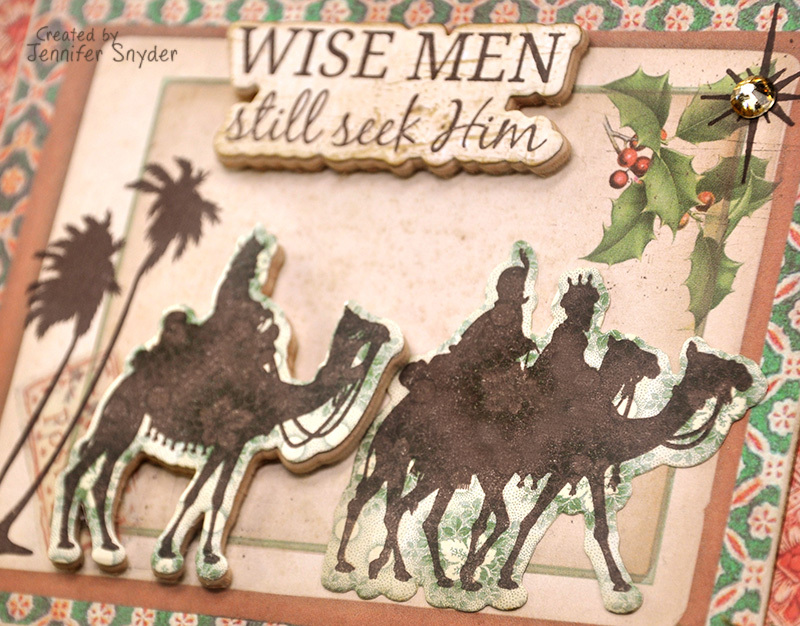 and coordinating Fun Stampers Journey - Adore Him Stamp Set. 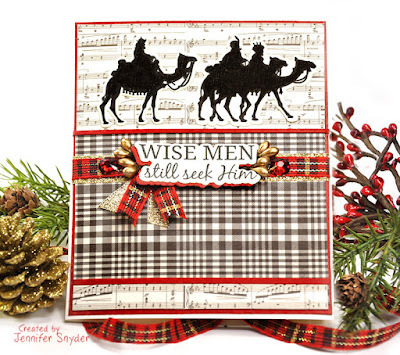 Classic, traditional, plaid infusion, holiday festive...so many options and styles. 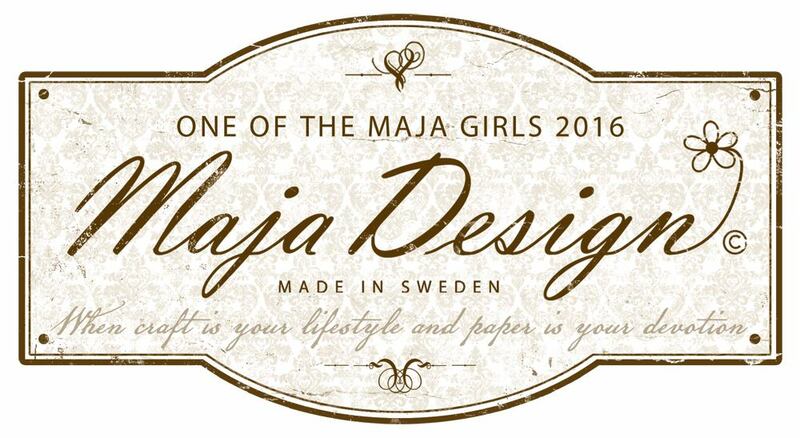 The best style is YOUR style. FSJ (Fun Stampers Journey) has a large selection of coordinating products to include die and stamps sets. This combo is heaven sent for those of us who don't really have passion or patience needed to fussy cut. 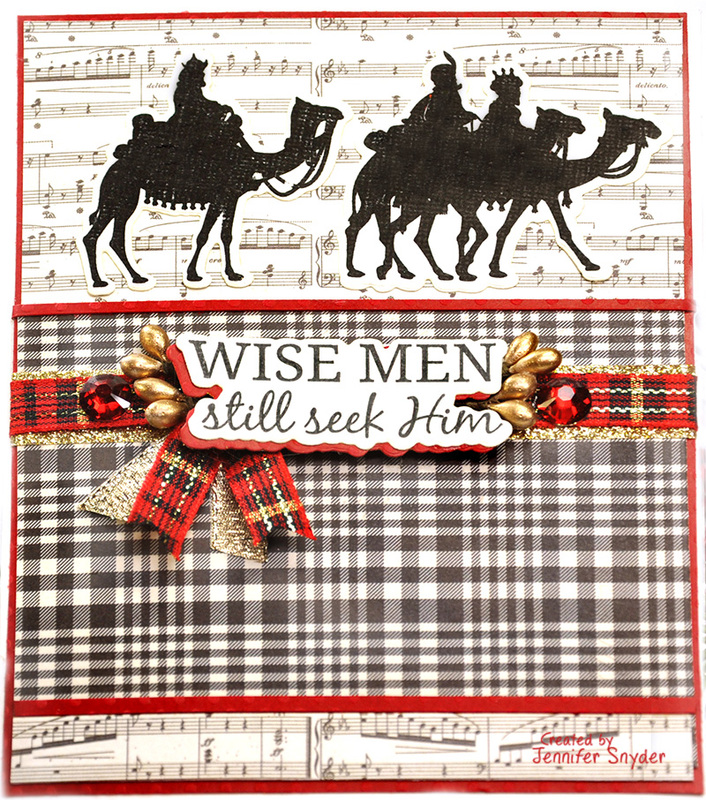 Here are some likes to the samples I created with this FSJ Adore Him Die/Stamp Coordinating Set. Check out this card on my blog here. Check out my plaid infused card here. You can see about this card here. You'll find this festive card here. 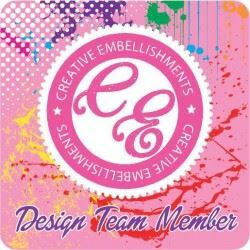 I hope you are as excited as I am about this new Journey! 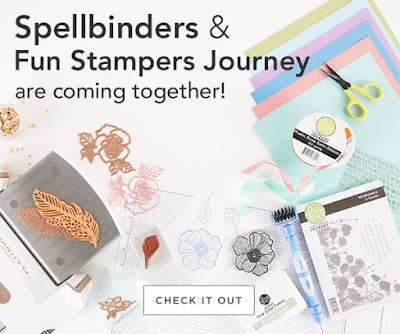 Shop for the Fun Stampers Journey Embellishments. Shop for FSJ products here. Today I am featuring only the Deer Santa extras from Spellbinders Card Club for November18 . This card showcases the papers, stickers and diecut shapes that are sold individually as "Extras" and are as sweet as can be. 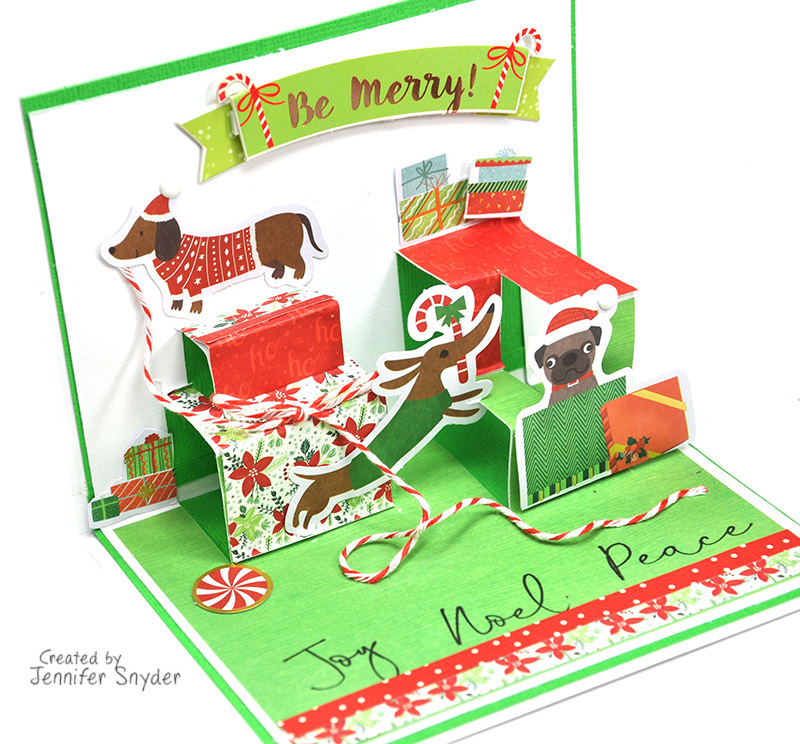 My husband loves reindeer so he was actually the inspiration for this card. 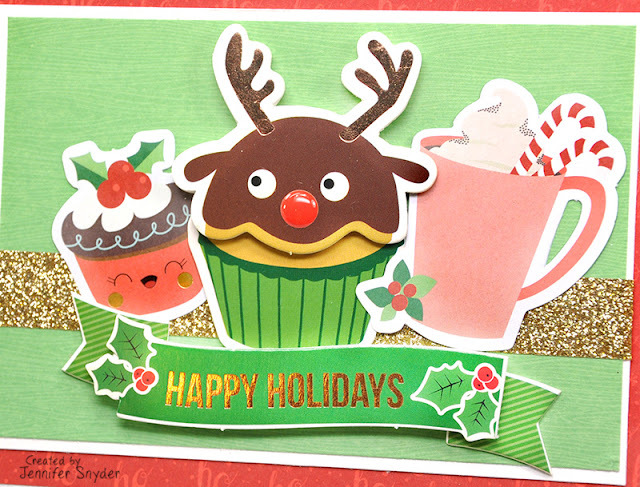 He looked at the reindeer cupcake and requested a special card for him. 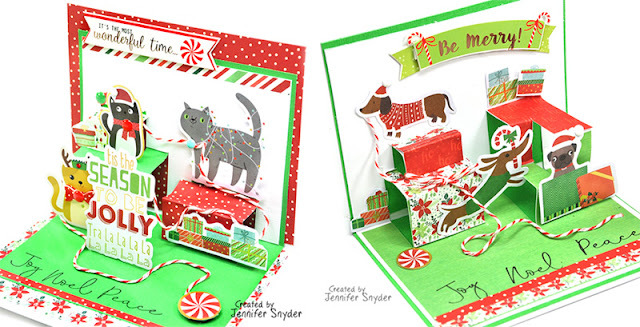 Do you LOVE Pop-Up Cards? I thought I'd make some pop-up pup and cat cards using the Spellbinders Card Kit Extras from the month of November. Are you a cat or dog person? Maybe a combo? 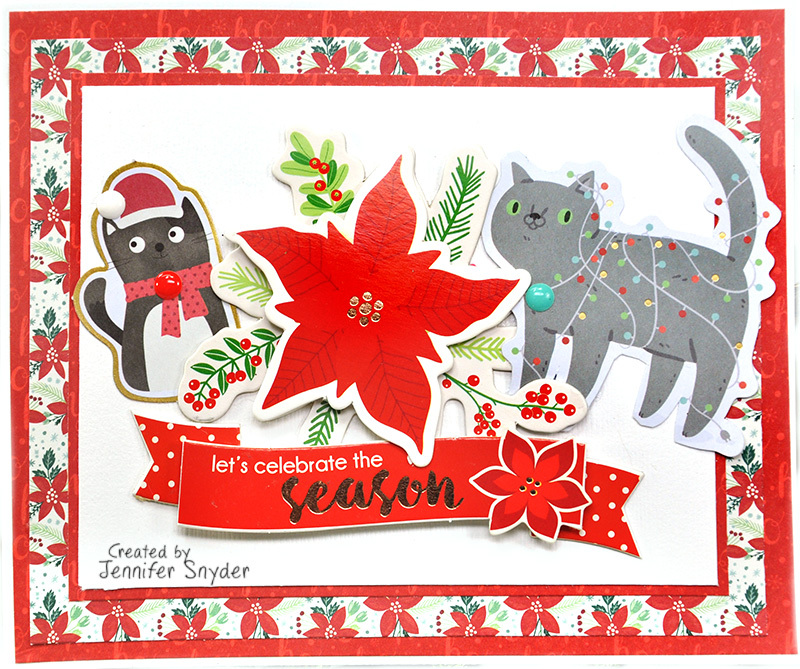 The November Deer Santa die cut shapes ( from the card kit of the month extras) includes a set of the sweetest dogs and cats ever. 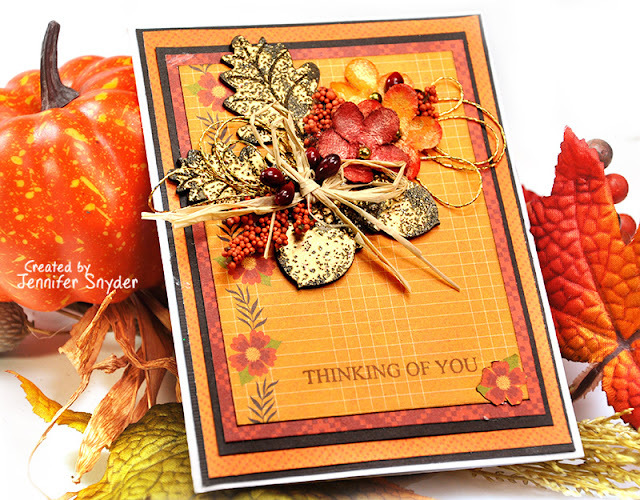 The "extras" are the same adorable embellishment that come in the card kits and are available for individual purchase. The die-cut pups and kitties are the focus of the pop-up cards. 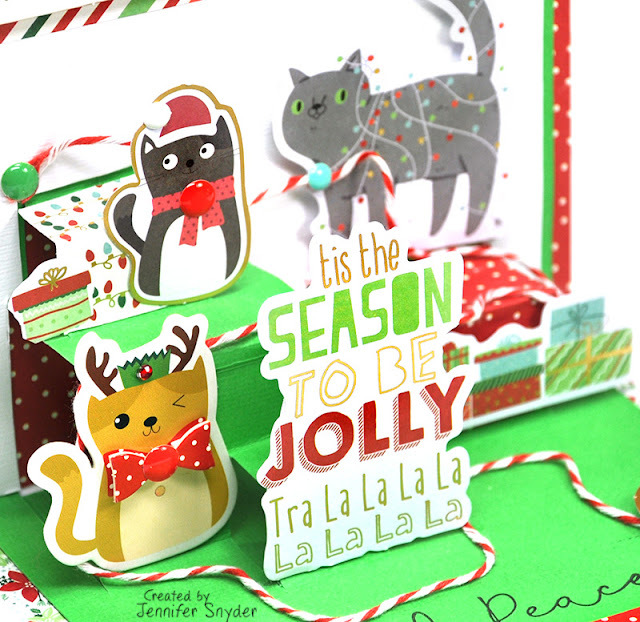 Make someone smile this holiday when you send a pop-up pup card and cute kitty card. 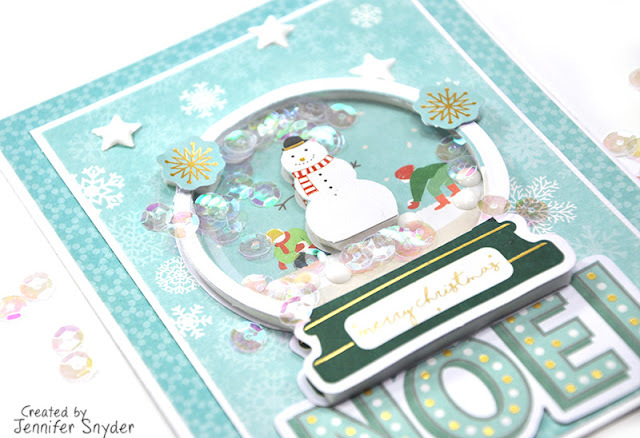 I have a 2 min easy tutorial that will help you see how easy these pop-up cards are made. Scroll down for the DIY video instructions. Today I am featuring only the extras from Spellbinders Card Club for November18 . 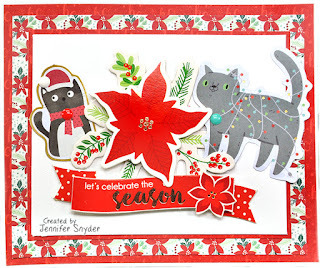 The Deer Santa die cut shapes ( card kit of the month extras) contains the sweetest dogs and cat shapes -perfect for creating a little fur-ball festivity, some puppy love, some kitty cuteness. 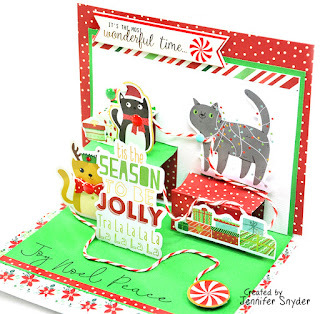 The whimsical cats are included in the Deer Santa die cut shapes Look how sweet this kitty pop-up card is? Here is a 10 second video of the pop-up action. The cats are all gussied up in their Christmas holiday finest - Santa hats, bows and Christmas lights. 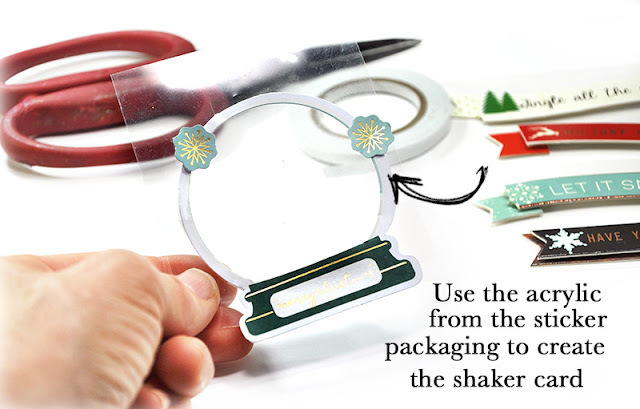 2) FJS thin metal dies are made of steel to give you clean cuts time and time again, without warping or dulling. 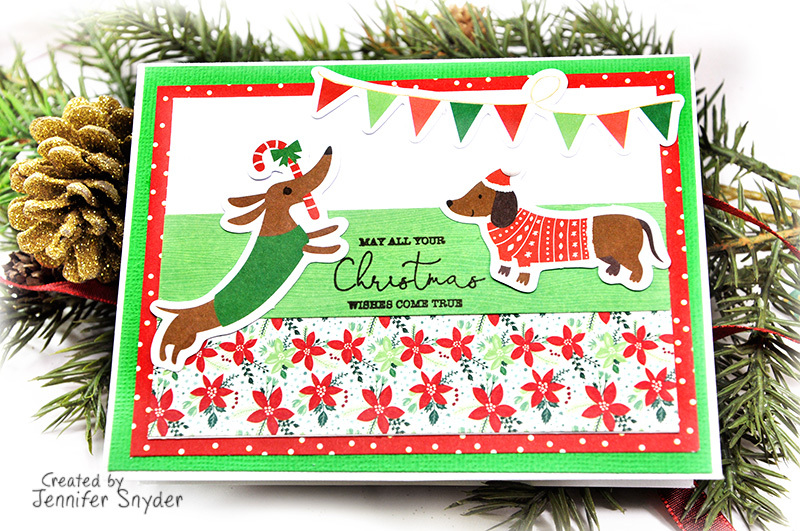 And, they’re coated in FSJ green so they're easy to find! 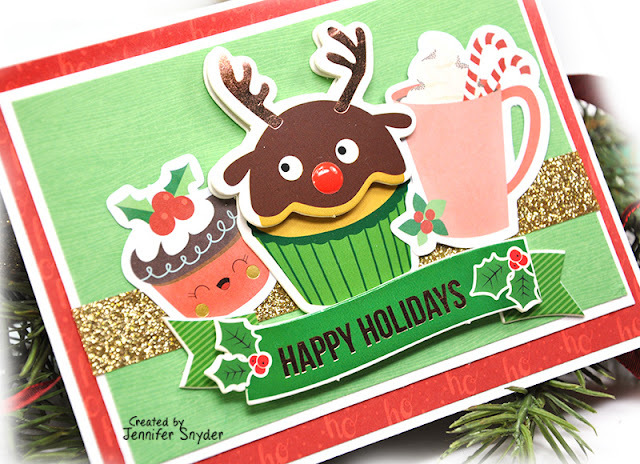 3) FJS offers over 50 exclusive colors – matching cardstock, ink, ribbon and accessories makes creating easy! 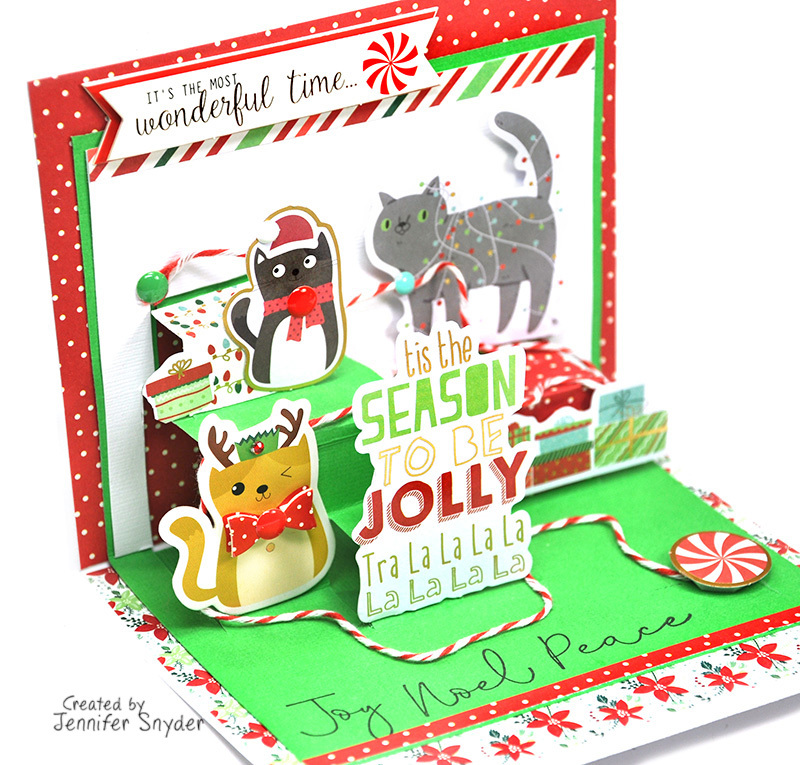 4) Over 50% of FJS stamps have coordinating dies – no more fussy cutting! Let me repeat... no more fussy cutting! We've established I'm not a fan of fussy cutting. Let's just say I don't hum a happy tune while I'm fussy cutting. This is exactly why I love dies with coordinating stamp sets. My paper choice is Simple Stories - Simple Vintage Christmas 6x8pad. 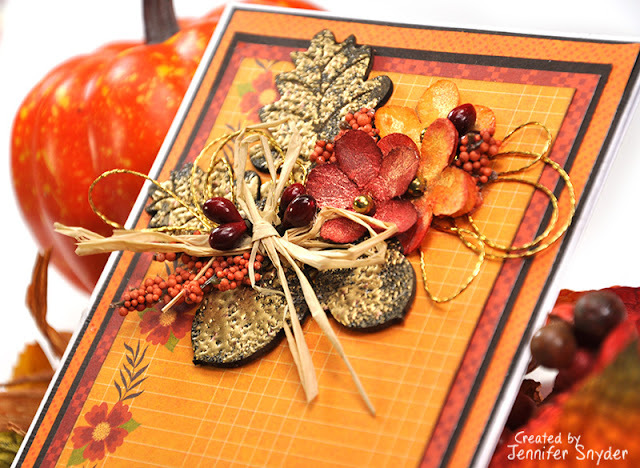 FSJ also has a wonderful line of embellishments. I dotted the holly and the Star of David with Holiday Sparkles Gem Embellishments Pack . Shop the entire assortment of FSJ embellishments here. 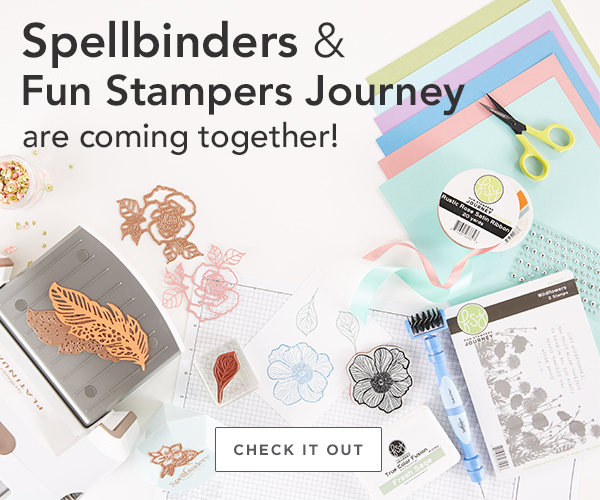 Spellbinders and Fun Stampers Journey? Yes!